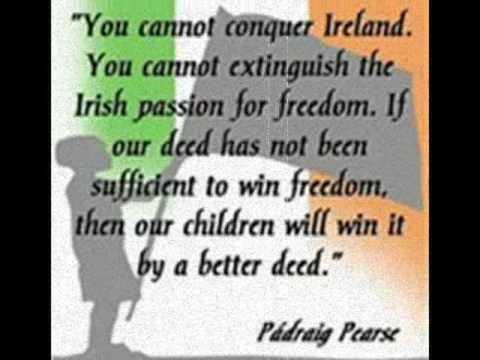 Welcome to this website which represents a Roll of Honour of those who fought and died for Irish Freedom. . While we are soon to commemorate the 100th anniversary of the 1916 Rising, let us not forget the men of 1798 and the Finians. The names of those who fought, were imprisoned and died for their country have been complied over about four years from lists in various old publications, and lists collected by local groups. We hope to add to the list, so if you have a story about and ancestor who has taken part in the fight for Irish freedom, please get in touch. Thomas J.Clarke; Roger Casement; Eamonn Ceannt; James Connolly; Cornelius Colbert; Edward Daly; J.J.. Heuston; Thomas Kent; Michael Mallin; Sean MacDermott; Thomas McDonagh; John McBride; Michael O’Hanrahan; William Pearse; Patrick H. Pearse; Joseph Plunket. 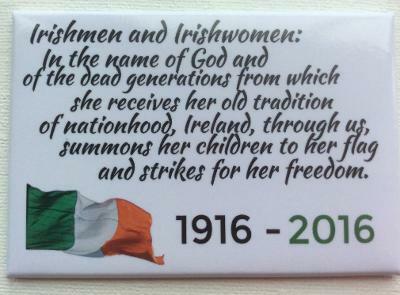 KILLED WHILST FIGHTING FOR IRELAND DURING EASTER WEEK 1916. Connolly Sean; Corcoran James; Coyle Harry; Costello John; Cromean John; Crinigan John; Clarke Philip; Carrigan Charles; Darcy Charles; Darcy Peter; Donelan Brendan; Doyle Patrick; Dwan John; Ennis Edward; Farrell Patrick; Fox James; Geoghegan George; Howard Sean; Hurley John; Healy John; Kealy John; Kealy John; Keogh Gerald; Keily John; Keating Con; Kent Richard; Macken Peter; Macken Francis; Manning Peter; Murphy Richard; Murphy D; Malone Michael; Murray D; McCormack J; O’Reilly Thomas; O’Carroll Richard; O'Flanagan Patrick; O’Grady John; Owens J; Quinn James; Rafferty Thomas; Ryan Frederick; Reynolds George; Sheehan Domhnall; Shortis Patrick; Traynor John; Walsh Edward; Walsh Philip; Whelan Patrick; Weafer Thomas; Wilson Peter ;Martin Reaney, from The Weir in Kilcolgan Galway. He was the only Irish Volunteer to die during the Rising in Galway Easter week 1916. Sheehy Skeffington Francis, who was shot in Portobello Barracks April 1916. McGinley C; McGinley Liam; McGinley Patrick; McGinn Conway; McGinty Mrs L (nee Burke); McGrane Christopher; McGrath Patrick J. (Jnr); McGrath Thomas; McLoughlin Mary; McMahon Donal; McMahon Sean; McManus Patrick; McNally John; McPartland Frank; McPartlin Peter C; Meagher Patrick; Sorca Bean Thomas Mhic Ruaidigh; Milroy Sean; Mooney Patrick; Moore Edward J; Mulcahy Mary J; Mulvey WP; Mulvihill Michael; Murphy Charles; Murphy Fintan; Murphy Kathleen; Murphy Martha; Murphy Michael; Murphy Mrs Gertie; Murphy RJ; Murphy Stephen; Murray Eileen; Murray PJ; Murray Thomas; Murtagh Francis; Ni Ainle Maire; Ni Dhubhthaigh Luise G; Ni Foghludha Nora; Ni Riain Aine; Noone Mrs Ellen; Norton James; Nugent Michael; Nugent Patrick; O Bhaonain Seamus; O Briain Tomas; O Buachalla Domhnall; O Caoimh Padraig; O Ceallaigh Eamon; O Cearbhail Peadar; O Donnchadha Tomas; O Mordha Padraig; O Murchadha Peadar; O Murchu Miceal; O Nunain Sean; O Roagain Liam; O Riain Liam; O Riain Seamus (Dr Jim Ryan); O Briain Eoghan; O' Brien John; O' Brien Matt; O’Brian Michael; O’Byrne James; O’Carroll Kevin; O’Connell Mary; O’Connor James; O’Connor Johnny; O’Connor Patrick; O’Connor Peter; O’Gorman Liam; O’Hanrahan Mary; O’Higgins Mary; O’Kelly Fergus F; O’Kelly Joseph; O’Kelly Sean T; O’Mahoney Eamon J; O’Mahoney Matthew; O’Moore Donough; O’Neill James; O’Neill John; O’Neill John; O’Neill Maire; O’Neill Seamus; O’Reilly Cathleen; O’Reilly JK; O’Reilly John; O’Reilly Joseph; O’Reilly Mary (Mrs Corcoran); O’Reilly MW; O’Reilly Thomas; O’Sullivan Gearoid; O’Sullivan James; O’Sullivan Laura Daly; O’Toole William; Oman George; Parnell Matthew; McGrath Patrick J (Sen); Pearse PH; Pearse William; Pedlar Liam; Plunkettt Joseph; Price Sean; Purcell C; Quinn Margaret; Rafferty Mrs MJ (nee Walsh); Rankin Patrick; Redmond Andy; Redmond Annie; Reid John; Reilly Matthew; Reynolds John R; Reynolds Molly; Reynolds Peter J; Richards Bridie; Ridgeway Harry; Ring Christopher; Ring Joseph; Ring Patrick; Robinson Seamus; Roche Thomas J; Roche William; Rossiter C; Roth Thomas; Ryan Oliver; Ryan Phyllis; Ryan Thomas; Saurin Charles; Scollan JJ; Scullin Francis; Scullin Patrick; Seville James; Sexton James; Sheridan Frank; Sheridan James; Shields Arthur; Shortis Patrick; Simpson Tilly; Slater Bridie (nee Walsh); Slattery Peadar; Slevin Mrs MJ (nee Stapleton); Smith Charles; Smyth Lucy (Mrs Tom Byrne); Stafford Brooks Christine; Stanley Joseph; Steinmayer Charles; Stephenson Patrick J; Stritch Jim; Stynes Mrs Ellen (nee Lambert); Supple Padraig; Swan Anthony; Sweeney James; Sweeney Joseph; Sweeney Patrick; Tallon Christopher; Tallon James; Tannam Liam; O’Rahilly The; Thornton Frank; Thornton Hugh; Thornton Patrick; Tobin Annie (Mrs Soalfield); Toomey Joseph; Toomey Statia (Mrs S. Byrne); Traynor Oscar; Treston Cathleen; Trimble Joseph; Touhy Dr JJ; Touhy Patrick; Turner Cormac; Turner Francis; Turner Joseph; Twamley John J; Tyrrell Timothy; Ui Faoithe, Brigid Bean; Ui Glasam Bean (Veronica Ni Riain); Wade Michael; Walker Charles; Walker Charles; Walpole RH; Walsh Christopher; Walsh Edward; Walsh James; Walsh Joseph; Walsh Mark; Wardock James; Weafer Patrick; Weafer Thomas; Wheatley Thomas; Whelan Joseph; White John J; White Michael; Willis Henry; Wisely Esther (Mrs S O’Moore); Wren James. Banks Henry; Bermingham John; Boylan Stephen; Bracken John Junior; Bracken John; Breen Sean; Brennan Patrick; Brennan Patrick, Breslin Toby; Brown William; Browne James; Burton Frederick; Byrne C. Byrne Dermot; Byrne Henry; Byrne John; Byrne Joseph; Byrne Michael; Byrne Michael; Byrne Patrick; Byrne Peter; Byrne Thomas; Carol Dudley; Casey Leo; Cassidy Thomas; Coates Peter; Colgan Daniel; Conroy William; Cooper Robert; Cosgrave John; Coyne Thomas; Cullen Michael; Cullen Sean; Daly James; de Valera Eamon; Donnelly Simon; Donovan Michael; Doyle James; Doyle Patrick; Doyle Patrick; Doyle Seamus; Dunne John; Ennis Edward; Finn Timothy; Fitzgerald James; Fitzgerald Leo; Fitzgerald Thomas; Fitzgerald William; Flanagan Patrick; Fleming Michael; Flynn John A; Fulham Thomas; Gill James; Gordon Edward; Grace James Joseph; Griffith Martin, Guilfoyle Joseph; Henry James; Hickey Michael; Humphreys Richard; Jackson Francis; Jackson Joseph; Kavanagh James Kavanagh Liam; Kavanagh Peadar; Kelly Patrick; Kelly Thomas; Kenny Charles; Kinsella John; Kirwin Edward; Lalor Eamon; Leonard Edward; Lifford Leo; Lyons George A; Mac an Bhaird Padraig; Mac Giolla Bhridge Padraig; Mac Giolleaspaigh Padraig; Mac Uinseann Sean; MacDowall Cathal; Macken Peadar; MacMahon Sean; rMallon James; Malone Michael; Malone Robert; Martin Joe; McArdle Owen; McBride Patrick; McCabe Liam; McCabe Patrick; McCarthy Bernard; McCarthy Michael; McCurran Joseph; McDermott Sean; McDonnell Andrew; McDowell Patrick; Meagher Michael; Meagher Patrick; Merriman Michael; Molloy Joseph; Mullen Murtagh Patrick; Murphy Christopher J; Murphy John J; Murphy Liam; Murphy Richard; Murray Frank; Murray Michael; Murray Seamus; Nolan P; Nolan Patrick; Nugent John; Nugent Joseph; O Caomhanaigh Michael; O hAodha A; O Leannain Michael; O Meadhra Peadar; O Scolaigh Tomas; O’Brien William; O’Brien Liam; O’Byrne Joseph; O’Byrne Tom; O’Connor Jos; O Donoghue Denis; O Duinn Sean; O’Grady Anthony; O’Hanlon John; O’Keeffe Sean; O’Neill Andrew; O’Reilly Christopher; O’Reilly Patrick; O’Rourke Thomas; O’Shea Sean; Pearle Richard; Peate Thomas; Peelo Denis; Pender James; Porter Owen; Power Patrick; Purfield James; Quin Thomas; Quinn Sean; Rafter Liam; Redican James; Reid John J; Reid Patrick; Reynolds George; Roe Patrick; Roe William C; Rownan William; Ryan Cornelius; Stanley Liam; Stokes John J; Tannam Michael; Thompson Alexander; Traynor Thomas; Walker John; Walsh James; Walsh Thomas; Waters James; Whelan Patrick; Williams Patrick; Woodcock William. Arnold James; Boylan Thomas J; Brugha Cathal; Burke Frank; Burke James J; Byrne Joseph P; Byrne Liam; Carroll Leo; Ceannt Eamonn; Coady William; Condron William; Cosgrave W.T; Cullen Thomas; Donnellan Brendan; Downey John; Doyle Gerald; Doyle Peader; Evans Robert J; Farrell Michael; ffrench Mullen Douglas; Foran James; Gibson Edward; Gibson Michael; Glynn James; Irvine George; Joyce John V; Keegan Edward; Kelly Joseph F; Kenny James; Kerr Michael; MacCarthy Dan; Maguire James; McDowell William; McGlynn Sean; McKenna John; McMahon Daniel; Moloney Patrick; Morrissey James; Morrissey Patrick S; Murphy John; O’Brien Denis; O’Brien Liam; O’Brien Stephen L; O’Loughlin William; O’Doherty John J; O’Loughlin Patrick; O’Reilly Patrick; O’Reilly Richard; O’Shaughnessy Sean; Owens Sean; Quinn James; Rigney Paddy; Russell James; Sears David; Sweeney Michael; Tracey Sean; Traynor Sean; Ward Peter; Whelan Richard. Adams John; Alexander Nicholas; Brougham James; Burke Edward; Byrne Conroy Eileen; Conroy Sean; Corcoran James; Courtney Bernard; Craven Barney; Crothers Christopher; Daniels Harry; de Coeur Robert; Donnelly Michael; Doyle Denis; Doyle Joseph; Duffy Patrick; Dynan Christopher; ffrench Mullen Madeleine; Fitzmaurice Gerald, Fox James; Fox James; Foy Martin; Fullerton George; Geraghty Eugene; Gifford (nee Donnelly) Helen; Goff Bridget; Hackett Rosie; Halpin William; Hampton James; Henry Fred; Holden Patrick J; Hyland May; Jackson Peter; Joyce James; Joyce (Mrs) Maggie; Keenan Thomas; Kelly Annie; Kelly James; Keogh James; King Martin; Lambert J; Lawlor Patrick J; Leddy Peter; Little James; Duke Edward; McGrath Peter P; MacMahon ; Maguire James; Mahon John; Mallin Michael; Mannering E; Markieviez Madam; McArt Daniel; McCormick Richard; McDonald John; Monks Andrew; Moore (nee Wiseley) May; Murphy Fred; Murray Daniel; Doyle Christine; Nicholls Harry; OBriain Liam; O Briain Liam; OBrien Frank; O’Daly (nee Murtagh) Mrs Bridget; O’Daly Nora; O’Doherty Michael; O’Kelly Michael; O’Leary David; O’Neill John; O’Neill Jim; O’Reilly Joseph; O’Reilly Patrick; O’Shea Robert; Partridge William; Reynolds Percy; Robbins Frank; Ryan Frederick; Ryan Margaret; Shannon Martin; Skinnider Margaret. Adams John; Bailey Patrick; Bowman Joseph; Butler Matthew; Byrne Alphonsus; Byrne Christopher; Byrne Frank; Byrne James; Byrne Kate; Byrne Michael; Byrne Patrick; Cassidy Thomas; Clarke Joseph; Clince (nee Quigley) Maria; Colbert Con; Cooney O’Brien Annie; Cooney Lillie; Corcoran Joseph (Bro. Louis OFM); Corrigan James; Cosgrave Phillip; Cullen John; Darcy John; Dempsey William; Downey Joseph; Doyle Christopher; Doyle (nee Byrne) May; Doyle Thomas J; Doyle Thomas; Dunne Dennis K; Dunne Patrick J; Dwyer Michael; Edwards John; Farrelly (nee Mullally ) Rose; Fitzpatrick James; Fox William; Green (nee Kelly) Josephine; Grehan James; Harbourne Cooney Eileen; Harbourne Patrick; Harbourne Sean; Harman Patrick; Harmon (nee Hegarty)Brigid; Hendley (nee O’Keeffe) Emily; Holland Daniel; Holland Robert; Holland Robert; Holland Walter; Judge John Patrick; Kavanagh James; Kavanagh Martin; Kavanagh (nee Quigley) Pricilla; Kelly William; Kennedy Joseph P; Kennedy Margaret; Kenny James; Kenny Kieran; Keogh James; Kerrigan Owen; Keys John; Lamb Patrick; Leigh James; Liston Michael; Lynch (nee O’Hanlon) Sighle; Mac Diarmuid Louis; MacDiarmuid Dermot; Marinan Edward; Mason DHK; McCabe Edward; McCabe Michael B; McCabe Peter; McCabe William; McCarthy Patrick; McEvoy Christopher; McGarvan Josephine; Mcgrath Joseph; McGrath Patrick; McKenna Bernard; McNamara Rose; McNamee Agnes; Morgan John; Mullen Martin; Mullen Patrick; Murphy Francis; Murphy Kathleen; Murphy Seamus; Murphy Thomas; Murray Gabriel B; Murray Harry; Nolan George; O’Duinn Peadar; O‘Brennan Lily; O’Briain Donchadha; O’Brien Patrick; O’Brien Laurence; O’Brien Peadar; O’Brien Padraig; O’Byrne; Hugh; O’Byrne Sean; O’Caomhanaighe Tomas; O’Carroll Joseph; O’Gormon John J; O’Gorman Joseph;O’Hagan James; O’Hanlon Mollie; O’Neill Edward; O’Neill Joseph; O’Neill Michael; O’Riordan Michael; O’Rourke Patrick; O’Toole John; Pairceir Seosamh; Pender Henry; Power Arthur; Power Joseph; Power Liam; Roche William; Saul John; Simmons (nee O’Flaherty) Margaret; Spicer Josephine; Teehan James; Troy Daniel; Troy Patrick; Venables Thomas; Walsh James; Walsh Patrick; White Michael ;Young EC; Young Patrick; Young Robert; Young Thomas. Allen (nee Murray) Mary; Allen Thomas; Archer Liam; Beaslai Piaras; Beggs Daniel J; Bent John; Bevan Charles J; Bevan Charles; Bevan Joseph; Bevan Thomas J; Bibby Fr Albert OMC; Bird James; Blackhead J; Blanchfield Peter; Brabazon Joseph; Breslin James; Breslin Peadar; Breslin Thomas; Bridgeman Edward; Burns James; Butler George; Byrne (nee Healy) Teresa; Byrne Ambrose; Byrne Charles; Byrne John; Byrne Laurence; Byrne Mary; Byrne Patrick; Byrne Sean; Byrne Seamus; Byrne William; Cahill James; Callender Ignatius; Campbell M.J; Carron Maire; Cassidy Thomas; Clancy Peadar; Clarke James; Cody Sean; Coffey Joseph; Coghlan Francis X; Coleton (nee Murnane) Elizabeth; Collins Maurice; Condron Luke; Conroy James (snr); Copeland (nee Byrne) Margaret; Cosgrove Michael; Costigan Nellie (nee Ennis); Cox Redmond; Coyle William; Cullen Joseph; Cullen Thomas; Daly Edward; Darker Michael; Delemere Edward; Dempsey James; Derham Michael; Derrington Liam; Doggett Christopher; Domican John; Donohoe Sylvester; Dowling Andrew; Dowling John; Dowling Thomas; Dwan John; Edwards Michael; Ellis Sean; Fagan John; Fagan Michael; Fahy Anna; Fahy Frank; Farrell John; Farrell Patrick; Farrell Thomas; Farrelly Christopher; Farrelly Sean; Farren Stephen; Feeney Gerald; Fitzpatrick Denis; Flood Sean; Fogarty John; Fogarty Patrick Forde Sean; Foy Frederick; Frawley Denis; Gahan Mathew; Gaynor Arthur; Geraghty Sean; Gilsenan Patrick; Graham James; Green Patrick; Griffith William; Grimley Michael; Halpin John; Halpin Peadar; Harding Frank; Hartnett Alf; Harrison Thomas; Healy Cathleen; Healy Peadar; Henderson Thomas; Hendrick Edward; Hendrick James Joseph; Heron Aine; Hogan PJ; Hogan William Conor; Howard Con; Howard Sean; Howlett Michael; Hurley Sean; Hyland Thomas; Hynes Sean; Kavanagh James; Kavanagh James; Kearns Patrick; Keating (nee Morkan) Pauline; Kelly Joseph; Kelly Michael; Kelly Patrick; Kennedy Sean; Kennedy James J; Kennedy John; Kenny John; Kenny John; Laffan Nicholas; Lawlor (nee O’Carroll) Mary; Lawlor Frank; Lawlor Larry; Lawlor Sean; Ledwith Emily (nee Elliott); Ledwith Peter; Leggett Robert; Lennon Nicholas;Lowe Arnold; Lynch Gilbert; Lyons Charles; Lyons Edward; Lyons John E; Mac an Bhaird Gilbert; MacMeartaigh M; MacDonough Joseph;. Macken Patrick; MacMearnam Maighnas; MacNamara Patrick; Magee Michael; Maguire Thomas; Manning Peadar; Martin Kathleen; Mason Frank; Mason G; McCabe Frank; McCann Thomas J; McCormack Christopher J; McCormack John; McDonnell Thomas; McEvatt Louis; McGill Joseph; McGuinness Catherine; McGuinness Joseph; McGuinness Rose; McKeon (nee Murrane) Brigid; McKeon Owen; McKeon William; McLoughlin Peter; McMenimun Joseph; McNally Francis; McNamara James; McNestry Patrick; McNulty Michael; McNulty Peadar; McQuaile (nee Moloney)May; Meade Henry; Meade Walter; Meade William; Merrigan Thomas; Merrigan Michael; Mooney Patrick; Morkan Eamon; Morkan Phyllis; Mulkearns James J; Mullen Peter; Munroe Thomas J; Murnane Liam; Murnane (nee Martin) Margaret; Murphy Eileen (nee Walsh) Murphy Francis Charles; Murphy Hubert J; Murphy Martin; Murphy Michael; Murphy William; Murray Joseph H; Murtagh Laurence J; Murtagh Patrick; Musgrave Denis J; Neary Denis; Neilan Arthur; Nevin Patrick; Ni Briain Eilis (nee Elliott); O Braonain Eamonn: O Briain Sean; O Briain Tomas; O Canain Tomas; O Ceallaghan Donnchadha; O Cearbhaill Liam; O Cearbhaill Peadar; O Conallan M; O Donnabhain Conn; O Foghludha Miceal; O nEigheartaigh Diarmuid; O Loingsigh Michael; O Lionseigh Fionan; O Murchadha Cristoir; O Murchadha Briain; O Murchadha Michael; O Nuallain Tomas; O Riain Liam S; O Scollaighe Michael; O Sullivan James; O’Brien Patrick; O’Carroll (nee O’Keeffe) Annie; O’Carroll Mary (nee O’Sullivan); O’Carroll Michael; O’Carroll Robert; O’Carroll Sean; O’Conaill; Mort; O’Connor John S; O’Connor John; O’Connor Patrick J; O’Dea Michael; O’Doherty Fionan; O’Doherty Liam; O’Duffy Sean M; O’Flanagan Francis; O’Flanagan George; O’Flanagan Maurice; O’Flanagan Michael; O’Flanagan Patrick; O’Gorman Liam; O’Gorman Mary Christina (nee Hayes); O’Hanlon Bernard; O’Hanlon Patrick; O’Kelly Michael; O’Leary Patrick Joseph; O’Moore Sean; O’Neill Joseph; O’Neill Michael; O’Neill Patrick Francis; O’Neill William; O’Riordan Michael; O’Reilly Luke J; O’Reilly Peter; O’Reilly Thomas; Oman Robert; Parker Ellen (nee O’Flanagan); Pollard Frank D; Pollard Louisa (nee O’Sullivan); Pollard Stephen; Prendergast Sean; Rawley Albert Sylvester; Regan Laurence; Reid Sean; Richmond John; Roache Joseph; Michael Michael Joseph; Ryan William; Saunders Michael; Savage ;Martin Scully William; Sheely Charles; Sheerin Thomas P; Sheridan James; Sheridan John; Shouldice Frank; Shouldice Jack; Smart Thomas; Stephenson Mary; Swan Patrick; Sweeney Joseph; Thornton (nee Lyons) Brigid; Tierney Michael; Tobin Liam; Tobin Michael; Travers Edward; Peig Bean Ui Chonnallan; Ui Conaill Eilis(nee Ni Riain); Walsh James; Walsh Philip; Ward George; Ward Sean; Whelan George; Williams John J; Wilson Mark. Patrick Vincent Coogan . Arnold, James; Boylan, Thomas J; Brugha, Cathal; Burke, Frank; Burke, James J; Byrne, Joseph P; Byrne, Liam; Carroll, Leo; Ceannt, Eamonn; Coady, William; Condron, William; Cosgrave, WT; Cullen, Thomas; Donnellan, Brendan; Downey, John; Doyle, Gerald; Doyle, Peadar; Evans, Robert J; Farrell, Michael; ffrench Mullen, Douglas; Foran, James, Gibson, Edward; Gibson, Michael; Glynn, James, Irvine, George; Joyce, John V; Keegan, Edward; Kelly, Joseph F; Kenny, James, Kerr, Michael; MacCarthy, Dan; Maguire, James; McDowell, William; McGlynn, Sean; McKenna, John; McMahon, Daniel J; Moloney, Patrick; Morrissey, James, Morrissey, Patrick S; Murphy, John; O Flathartagh, Cathal; O Flathartagh, Liam; O’Brien, Denis; O’Brien, Liam; O’Brien, Stephen L; O’Loughlin, William; O’Doherty, John J; O’Loughlin, Patrick; O’Reilly, Patrick; O’Reilly, Richard; O’Shaughnessy, Sean; Owens, Sean; Quinn, James; Rignet, Paddy; Russell, James; Sears, David; Sweeney, Michael, Tracey, Sean; Traynor, Sean; Ward, Peter; Whelan, Richard. Balfe, Richard C; Brennan, James J; Brooks, Fred; Clarke, John; Coleman, Richard; Crenigan, James; Cullen John Francis; de Roiste, E; Harrington, Sean; Hueston, Sean; Levins, George; Marks, James; Meehan, William; Norton, Joseph; O Broin, Seosamh S; O’Ceallaigh, Padraig; O’Dea, William; Peppard, T; Stains, Liam; Stephenson, PJ; Wilson, James; Wilson Peter (Killed in action) ;Wilson, Peter, Wilson, William. Blanchfield, Thomas; Brennan, Maurice, Dempsey, James; Dunne, Patrick, Faulkiner, James, O’Reilly, Samuel P;, John; McArdle, John; O’Higgins, James, O’Reilly, Samuel P.
Boland , Patrick; Gilligan, Bob; Holohan, Patrick Hugh; Marie, Louis, Martin, Christopher; Martin, Eamon. 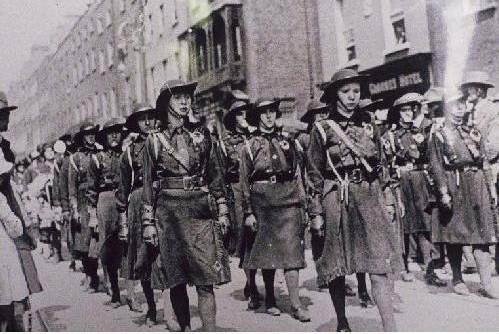 G.P.O: Carron Brigid, Carney Winifred, Ennis Nellie, Gavan Nora, McGuinness, Mrs Joe, McLoughlin May, McMahon Sorcha, Meade Florrie, Milner Jenny, Mitchell Carrie, Morkan Pauline, O’Farrell Elizabeth, O’Sullivan Mollie, O’Sullivan Dolly, Ryan Aine, Ryan Minnie, Ryan Margaret, Ryan Phyllis, Ryan Eilis, Walsh Martha, Walsh Brigid, Walsh Kate. COLLEGE OF SURGEONS, STEPHEN’S GREEN: Caffrey Chris, de Markievicz Countess, Derham Mary, Devereux Mary, Ffrench Mullen Madeleine, Foley Nora, Foley Brigid, Foley Date, Gahan May, Gifford Nellie, Gough Brigid, Hacket Rosanna, Hyland Molly, Kelly May, Kelly Sarah, Kelly Martha, Kempson Lily, Ryan Margaret, Skinnider Margaret, Spicer Josephine, Smyth Lucy, Sullivan Mary, Sullivan D, Taaffe Aoife, Treston Catherine, Twomey Statia. CITY HALL: Davis Bridget, Connolly Mrs, Lynch Bessie, Lyons Brigid, Lynn Dr. Kathleen, Maher Kathleen, Moloney Helena, Norgrove Annie, Norgrove Emily, O’Brennan Lily. Shanahan Jennie, Simpson Matilda. O’Reilly Mollie. Brigade Staff: Commdt. Tomas MacCurtain, March 20, 1920; Commdt. Terence MacSwiney, Oct. 25, 1920; Commdt. Denis Barry, Nov. 20, 1923. Second Battalion – C Company – Patrick O’Donoghue, Nov. 23, 1920; Seamus Quirke, Sept. 9, 1920; Tadhg O’Sullivan, April 19, 1921; D Company – Charles J.Daly, June 29, 1921; John O’Brien, September 14, 1922; E Company – Patrick Trahey, Nov, 23 1921; . James Mehigan, Nov. 23 1920; Stephen Dorman, 23 May 1921; G Company – Eamon Tierney, Dec. 16 1920; Charles Daly,March 1 1921; William Spillane, June 30 1922; George Bourke, Dec. 22 1923; H Company – Joseph Murphy, Oct. 25 1920. Bandon, Dec 3 1920, Bandon; Lieut. John Donohue, Shannon St., Bandon, Dec 3 1920, Bandon; Section Commander Joe Begley, Bandon, Dec. 3 1920, Bandon; Lieut. Michael McClean, Schull, Dec. 8 1920, Gaggan, Bandon; Volunteer Timothy Crowley, Behigullane, Dunmanway, Dec. 14 1920, Dunmanway; Captain Jeremiah O’Mahoney, Paddock, Enniskeane, Dec. 1920 Dunmanway; Enniskeane; Volunteer Patrick Donovan, Timoleague, Jan. 21, 1021, Courtmacsherry; Volunteer Daniel; O’Reilly, Granassig, Kilbrittain, January 24 1821, Bandon; Lieut. Patrick Crowley, Kilbrittain, February4 1921, Timoleague; Section Commander Patrick O’Driscoll, Skibbereen, Feb. 7n 1921, Skiberreen. ; Volunteer Patrick Coffey and Volunteer Enniskeane, Feb. 14 1921, Kilrush, Enniskeane; Lieut. John Whelan, late of Liverpool, Feb. 15 1921, Upton; Lieut Patrick O’Sullivan, Raheen, Upton, Feb 15 1021, Upton; Section Commander Batt Foley, Ballymurphy, Upton, Feb. 15 1921, Upton; Volunteer Cornelius McCarthy, Ballinadee, Feb 16 1921, Crois na Leanbh, Kilbrittain; Volunteer John McGrath, Kilbrittain, Feb. 16 1921, Kilbrittain; Volunteer Timothy Connolly, Fearnagark, Kilbrittian, Feb 16 1921; Kilbrittain; Volunteer Jeremiah O’Neill, Knockpogue, Kilbrittain, Feb 16 1921; Crois na Leanbh, Kilbrittain; Commdt. Charles Hurley, Baurleigh, Kilbrittain, March 19 1921, Ballymurphy; Volunteer Peter Monahan, Bandon, March 19 1921, Crossbarry; Volunteer Jeremiah O’Leary, Leap, March 19, 1921, Crossbarry; Volunteer Con Daly, Ballinascarty, March 19 1921, Crossbarry; Volunteer Timothy Whooley, Ballineen, March 22 1921, Shannonvale; Captain Frank Hurley, Laragh, Bandon, May 9 1921, Bandon; Volunteer Geoffrey Crowley, Dunmanway, June 7 1921, Behigullane; Lieut.Con Murphy, Timoleague, May 11 1921; Kilbrittain; Volunteer Matthew Donovan, Quarries Cross, Bandon, June 10 1921, Quarries Cross; Volunteer John Murphy, Bandon, June 22 1921, Cloghane; Commandant Michael O’Neill, Kilbrittain, April 29 1922, Ballygroman; Section Commander Patrick McCarthy, Kilcoe, Ballydehob, August 1922, Skibbereen; Commandant Gibbs Ross, Bantry, August 30 1922,Bantry; Captain Patrick Cooney, Skibbereen, August 30 1922 Bantry; Lieut. Donal McCarthy, Bawn, Drinagh, August 30 1922, Bantry; Lieut Michael Crowley, Glandore, August 30 1922; Bantry; Volunteer Patrick Pearse, Kinsale, Oct. 4 1922, Upton; Volunteer Daniel Sullivan, Kinsale, Oct. 4 1922, Upton; Volunteer Michael Hayes, Bandon, Oct. 4 1922, Upton; Volunteer Daniel Donovan, Clogagh, Oct. 4 1922, Timoleague; Section Commander Tadhg O’Leary, Macroom, Nov. 4 1922, Ballineen; Volunteer John Howel, Clonakilty (formerly of Doneraile) Nov. 4 1922, Enniskeane; Volunteer Patrick Duggan, Bandon, Nov, 17 1922, Glengariff; Assistant Q.M.G. Richard Barrett, Holyhill, Balineen, murdered Dec 8 1922, Mountjoy; Volunteer George Dease, Castlehaven, Dec. 8 1922, Coachford; Captain Lurence Cunningham; Clonakilty, Feb. 15 1023, Lyre; Volunteer John O’Connor, Innishannon, Murdered March 7 1923 Kealkil; Voluteer Michael Tobin, Ballineen Nov. 1923 Grattan Street, Cork. 4th Battalion, Carlow Brigade: Those who gave their lives in the Battalion ares during the fight for Irish Freedom - 1916-23: M. Ryan, J. O'Farrell, P. O'Farrell, J. Hayden, M. O'Carroll, M. Fay, C. Byrne. Cusack Paul Dawson, Granard; MacAmhalgaidh E. Granard; Doyle Patrick, Granard; McGrath Michael Keenagh; Connaughton Pat, Longford Town; Cahill Wilson, H.J. Longford Town; Curran James, Newtownbarry; Farrell James, Whitehall. Ardee: Farrelly James, Matthews Thomas; Carlingford: Donnelly Patrick, Ferguson Michael, Hanlon James; Drogheda: Burke Thomas, Finnegan Joseph, Green Arthur,Keenan Michael J; Dundalk: Atkinson William, Barrett John, Berrill Patrick Joseph, Casey Pat, Clifford Peter, Finnegan John, Jennings James, Hall Samuel, Halpin Peter, Hamill Thomas, Hanratty James, Harty Thomas, Kerry Patrick, McCrave Thomas, McGeogh, Owen, McGuill Joseph, McQuillan Philip; Murtagh Larry, Murphy Peter, Neacy Frank, O’Neill Arthur, O’Neill Felix, Sharkey Thomas, Tuite Daniel, Waller J.J.; Dunleer: Butterly John, Butterly Nicholas, Kelly James, Kelly Thomas, Layng Joseph J:. Nr.Westport: Duffy Michael, Aughower, Hughes Owen, Aughower, Keane Manus, Aughower, Tunney Patrick, Aughower. Kelly Joe, McCormack Thomas; Morley John F; O’Gara B, O’Gara Thomas F; Ryan Patrick J; Shouldice Bertie; Shouldice Frank; Trimble Joe; Waldron Eamon, Cong; O’Corcoran John, Kiltimagh; Westport: Cryan Bart; Derrig Michael; Derrig Thomas; Doris Pat J; Gannon Edward; Gavan Thomas; Gill Joseph; Haran Edward; Hickey Charles; Hughes Charles; Kelly Michael; McBride Joseph; McDonagh John; Malone James; Ring Michael Joe; Ruddy Joseph; Sammon Edward; Walsh Thadduse. Geoghegan John, Stradbally. Johnny Graves, Jackie Walshe. Athlone: Hurley John; Martin Edward; Melinn Peter; Berry William, Glasson; Ledwith Peter, Moate; Tyrrellspass: Malone Seamus; Maloney Thomas; O’Coffey L.
Savage Martin, Ballysodare; Burke Patrick, Castlegal; Foley Hugh, Castlegal; Conway Andrew, Crystal Hugh, Gardiner George, Gilmartin William, Gunnigle Robert, Rooney Patrick all Cliffoney; Murphy Martin, Curry; O’Connell J.J. Sligo.,Lt Thomas Coff. Barrett Peter, Curraghboy; Bergin Sean, Tipperary; Carty Michael, Fourmilehouse; Conry Patrick, Castlerea; Coyle Patrick, St. John’s; Cull Michael, Arigna; Cull Seamus, Arigna; Doyle Patrick, Ballinagare; Durr Patrick, Ballintubber; Flannery Thomas, Ballaghaderreen; Flynn Patrick, Castlerea; Gill Patrick, Kilmore; Glynn Patrick, Loughglynn, Glavey Michael, Curraghroe; Hughes Thomas, Athlone; Keane Michael J, Lisacul, Killian Luke, Knockcroghery; Mannion Toby, Kiltoom; McGowan John, Tibohine; McDermott Stephen, Ballinagare; McDonagh Thomas, Sligo; McGlynn Terence, Cootehall; Molloy Joseph, Knockvicar; Monds James; Moran Patrick, Crossna; Mullooly Michael, Kilrustan; Mulrennan Seamus, Lisacul; O’Donohoe Frank; Kilglass; Partridge William P, Ballaghanderreen; Scally John, Ballyleague; Shannon Edward, Loughglynn; Tormey James, Westmeath; Tully Hubert, Tulsk; Tymon Patrick, Arigna; Vaughan John, Castlerea; Weir Edward, Ballintubber; Wynne Patrick, Killeevan: Above names inscribed on memorial at Elphin. Edward Carmody; Patrick Dalton; Michael Galvin; Patrick Hartnett; John Lawlor; John Linnane; Jeremiah Lyons;(Michael (Bob) MacElligott; Daniel Scanlon; John Sheehan; Patrick Walsh. Michael Brosnan, Patrick Buckley, John Daly, Thomas Fleming, Patrick C. Kenny, Bertie Murphy, Daniel Murphy, Michael O’Connell, Denis O’Connor, Jeremiah O’Leary, John Prendiville, John Savage, Richard Shanahan, James Walsh. James Daily, Denis Broderick, Michael Brosnan, John Browne, John Flynn, Patrick Herlihy, Richard Laide, John Leen, John McMahon, John Reidy, Maurice Reidy. Smith Michael, Athgarvan; nCorrigan William, Ballitore; Moran Edward, Balysax Curragh; Cosgrove Michael, Kilcock; O’Neill James, Leixlip; Colgan P. Colgan Pat, Kenny John, Kirwan Pat, Maguire John, Maguire Thomas, O’Buachalla Domhnall, O’Reagain Liam, O’Ryan Oliver, Tyrrell Tim, Maynooth; Harris Thomas, Prosperous. O Baicsteir, Seán S. O Raghallaigh, Seán S. O Raghallaigh. Daly Pat S, Loughran W.J, Martin Thomas, Nolan Thomas, O’Brien James, O’Reilly, Carrickmacross; O’Byrne Thomas, Castleblaney; Wilson Richard A, Rushe. Doyle Pat, Ferbane; Horan Mat, Tullamore. Thomas Gallinagh born 1895 of Donegal ancestry; served in Oglagh na h-Eireann from1921 to 1923. 1921: Capt. James McCarron, Capt. Con Boyle, Vol. Michael Heaney, Vol. James Gallagher, Lt. Owen Duffy, Lt. Joseph Duffy. 1923: Comdt. Gen Charles Daly, Brig. Gen. Sean Larkin, Lt. Dan Enright, Lt. Timothy O’Sullivan, Comdt. Neil Plunkett O’Boyle, Vol. Dan MacCanalogue. 1924: Vol. 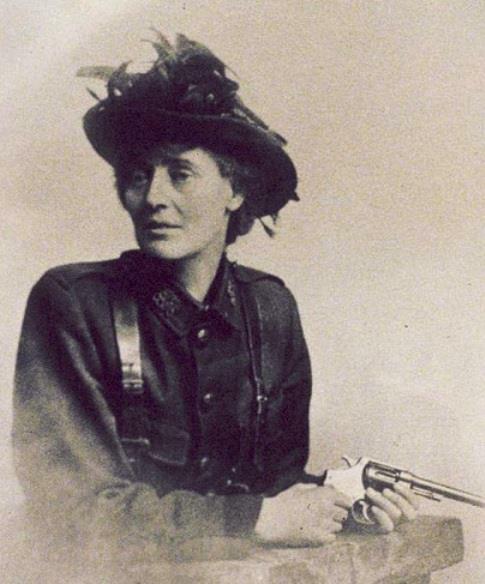 Mary McBride – Cumann na mBan. Officers commanding ~Second Division – Charles Daly (26), Lieut. Timothy O’Sullivan (23); Lieut. Daniel Enright (23); all originally from Co. Kerry. Comdt. Sean Larkin from Co. Derry. Died fighting British Forces in Pettigo, Co Donegal 4th June 1922 Patrick Flood, Bernard McCanney, William Kearney, and William Deasey died from his wounds on 6th June 1922. Cookstown, Patrick Loughlin, Died fighting for Ireland June 17, 1920. Gorey: Byrne John; McCann Andrew; Martin Ambrose; O’Ciardughain Sean; O’Reilly John; Scallan Thomas; Sinnott Pierce; Tobin John: O’Brien James, Kilmuckridge: New Ross: Lennon Philip;McCarthy Joseph; McGrath Mark; Murphy John; Walsh Joseph J; Whelan R: Cleary James, Newtown. Furlong Joseph, Summerhill; Wexford: Foley Edward; Murphy E; Murphy Nicholas J; O’Connor Matthew; Redmond Myles; Synnott John; Wicklow: Ford William Bray: Steynes James, Grangecon: Murphy Patrick, Carraigadaggin, Berni Radford, Murrintown. Con McCarthy Murrintown. Daniel Byrne,Ferns; James Byrne, Scar; Edward Cowman, Davidstown; Martin Connors, Enniscorthy; James Dempsey, Oulart; John Creane, Taghmon, Parick Connelly, Wexford; Robert Duggan,Wexford; William Doyle, New Ross; James Dunne, Ballintray; Sean R. Echingham, Gorey; Matthew Furlong, Wexford; Michael Furlong,Adamstown; F. Fitzgerald, St. Leonards; William Fardy, Tagoat; Thomas Fielding, Barntown; James Gleeson, St. Ciaran’s; Patrick Hogan, Wexford; Thomas Heffenan, Tinahealy; Sean Hartley, New Ross; Richard Humes, Camolin; George King, Enniscorthy; Sean Kavanagh, Ferns; Liam Kavanagh, Cronecribbon, Denis Leacy, Blackwater; Joe Leacy, Blackwater; John Leacy, Wexford; Thomas Murphy, Tagoat; John Moran, Enniscorthy; Michael Morris, Kyle; Liam Mellows, Castletown; Matthew Moran, Wexord; Con. MacCarthy, Murrintown; Martin Nolan, Ballindoney, Edward Nolan, Ferns; James O’Brien, Kilmichridge; Michael O’Brien, Boolavogue; Michael O’Hanrahan, New Ross; John O’Connor, Enniscorthy; Henry O’Connor, Enniscorthy; James Parle, Taghmon; Bernard Radford, Murrintown; Michael Radford, Murrintown; Bernard Roche, Screen; Martin Roche, Saltmills, James Roche, Asquinton; SeamusRafter, Enniscorthy, Maurice Spillane, Enniscorthy; Thomas Stokes, Enniscorthy; Richard Tyrrell, Craanford; Thomas Wafer, Enniscorthy, John Whitty, Wexford, Robert Walsh, St. Ciaran’s. Republicans Executed by the Free State Government during the Civil War. Nov.17th; James Fisher, Peter Cassidy, Richard Twohig, John Gaffney, Nov 24th: Erskine Childers, Nov. 30th: Joseph Sponer, Patrick Farrelly, John Murphy, Dec 8th: Rory O’Connor, Liam Mellows, Joseph McKelvey, Dec 19: Stephen White, Joseph Johnston, Patrick Mangan, Patrick Nolan, Brian Moore, James O’Connor, Patrick Bagnell. Dec 29th: John Murphy, John Phelan, Jan 8th: Leo Dowling, Sylvester Heaney, Lawrence Sheeky, Anthony O’Reilly, Terence Brady: Jan 13: Thomas McKeown, John McNulty, Thomas Murray, Jan 15; Frederick Burke, Patrick Russell, Martin O’Shea, Patrick McNamara, James Lillis; Jan 20th: James Daly, James Hanlon, Cornelius McMahon, Patrick Hennessy, Thomas Hughes, Michael Walsh, Herbert Collins, Stephen Joyce, Martin Burke: Jan 22nd; James Melia, Thomas Lennon, Joseph Ferguson; Jan 26th; Patrick O’Reilly, Patrick Cunningham, William Conroy, Colum Kelly: Jan27th; Patrick Geraghty, Joseph Byrne: Feb 26th: Thomas Gibson: Mar 13th; James O’Rourke, William Healy, James Parle, Patrick Hogan, John Creane: Mar 14th Sean Larkin, Daniel Enright, Charles Daly; April 11th; James O’Malley, Francis Cunnane, Michael Monaghan, John Newell, John Maguire, Martin Moylan: April 25th; Richard Hathaway, James McEnery, Edward Greaney; April 26th, Patrick Mahoney, May 2nd Christopher Quinn. The Forgotten Ten is the term applied to ten members of the Irish Republican Army who were executed in Mountjoy Prison, Dublin by British forces following courts martial from 1920-1921 during the Irish War of Independence. Based upon military law at the time, they were buried within the prison precincts, their graves unmarked in the unconsecrated ground. The names of the Forgotten Ten are Kevin Barry, Patrick Moran, Frank Flood, Thomas Whelan, Thomas Traynor, Patrick Doyle, Thomas Bryan, Bernard Ryan, Edmond Foley and Patrick Maher.